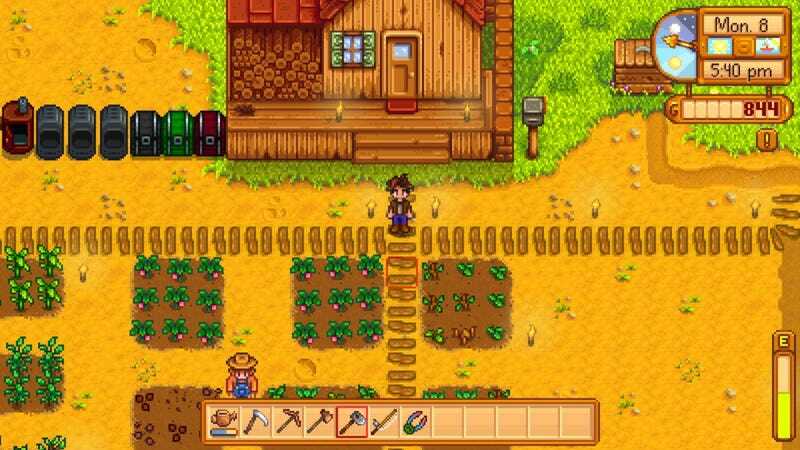 If you want to maximize your productivity in Stardew Valley, you’re going to have to read some tips on the Internet. Though maybe... don’t? Newly released on the Nintendo Switch, Eric Barone’s popular 2016 life-sim Stardew Valley is ostensibly about rejecting the soulless grind of the corporate world and embracing a simple life in the country. Your character’s grandfather has left you his farm in Stardew Valley, so you abandon your life of corporate-cubicle misery in search of something more meaningful. Stardew Valley can be a leisurely escape, but it can also be a game about stringently optimizing your professional and personal productivity in order to maximize sales and social expansion. Only if you play your cards perfectly can you quickly min/max your way to glorious profits, romance, and the satisfying feeling that you’ve cracked another game open and devoured its chewiest secrets. Rare is the video game that can be so at odds with its stated philosophy, depending on how you choose to play it. That notion of choice is important, though. A player can choose to play Stardew Valley however they want. I choose to play Stardew Valley in accordance with its stated values. I take a deep breath and relax. It’s another summer morning, and the birds are chirping. There’s no rush. There’ll always be another summer after this one, and another. I like the way Stardew Valley juxtaposes its mundane daily routines against the promise of greater, more mysterious rewards. I’ve got a farm, yes, and the crops need to be watered each morning. But I also just found a magical creature in the mine near town, and he’s speaking a language I can’t yet understand. It’s a contrast that’s often reflected in the game’s terrific soundtrack. Many of the tunes begin with a simple melody plucked out on a down-home instrument like a banjo or piano, then shift midway through to a more synth-dominated, dreamlike sound. All the twee charms of a simple small-town life, but with a hint of something more. In the year and a half since Stardew Valley came out, fans have dissected the game and laid its secrets bare. There are entire websites dedicated to optimizing your farm, schedule, crop rotation, and love life. A bit of cursory googling will land you on tips articles like the fantastic one by my colleague Patricia Hernandez, as well as dozens more like it. In exposing Stardew Valley’s many spinning gears and underpinnings, I risked ruining the game for myself. Over the weekend I skimmed Patricia’s post, my eyes widening as I neared the bottom. You can build what? You can marry whom? There’s a secret area where?? As I scrolled back up for a closer read, I stopped myself. Did I really want to know all this? Or would it just make me feel like I needed to play the game in the best, most productive way? In exposing Stardew Valley’s many spinning gears and underpinnings, I risked ruining the game for myself. I thought back to my recent experience with Destiny 2. I casually strolled through my first couple dozen hours with that game without a second thought. I gradually accumulated better and better gear, right up until I unraveled the arcane workings of endgame power levels and gear mods. All at once I felt annoyed, when previously I’d been having fun. I needed this piece of gear, not that one. I was missing out on better drops because I didn’t have the right thing in the right spot. And why was the mod system so opaque? Why was it so hard to get the gear I wanted? Why couldn’t I just play without worrying about all of this? The answer, of course, is that most players can just play without worrying about all of that. And I can play Stardew Valley without worrying about learning everything, as well. I like my little farm. I like gradually figuring out how to improve it. I like figuring out ways to optimize my time, like when I checked the weather, saw it was going to rain tomorrow, and chose that day to take in my watering can for an upgrade. But I also like feeling free to waste my time. There’ll always be another year. The game’s ticking clock can create an illusory sense of urgency, but in truth, I’ve got all the time in the world. I enjoy the soothing banality of Stardew Valley. I also like knowing that, should I so desire, I can go much deeper. The fact that the game is so complex and mysterious makes my choice to relax feel more meaningful. Once I’ve learned the best ways to exploit and optimize a game, I can’t unlearn them. Better, sometimes, to close the tips post and play on my own terms.